Chlorophyll is miraculous in many ways. Its molecules not only gives plants their lively green hue but are specifically arranged in and around photosystems which allows plants to obtain energy from light. 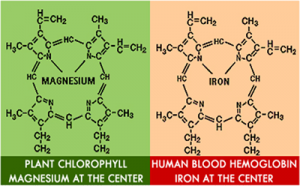 Chlorophyll molecular structure is absolutely identical to hemoglobin in human blood except for the center atom: in hemoglobin this is iron, whereas in chlorophyll it is magnesium. This means that liquid chlorophyll is to plants what blood is to humans. Chlorophyll benefits the whole body. Its health benefits has gained immense popularity among adepts of alternative health treatments. Chlorophyll is known as an effective detoxifier which help cleansing the body of toxins manifested in unpleasant breath or body odor. However it does more than that – chlorophyll also binds with toxins like heavy metals and releases them in organs which can carry these toxins away or process. Many nutritionists promote chlorophyll for its ability to cleanse the colon, combat free radicals, speed wound healing and improve circulation of oxygen throughout the body. It has also been suggested that chlorophyll can benefit people with iron deficiency ( anemia), because chlorophyll contains a single atom of iron just like human hemoglobin. This can help to oxygenate the bloodstream even through an iron deficiency. 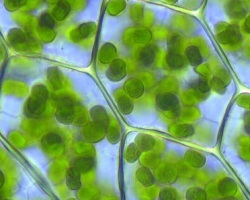 Chlorophyll has also been shown to help build up red blood cells, which is also benefit to people suffering from anemia. A recent study at Oregon State University (OSU) has also discovered that chlorophyll is a very effective defender against bodily absorption of aflatoxin, a fungal contaminant found in many legume stocks and grain. Partients who took chlorophyll alongside with aflatoxin did not absorb the carcinogen as readily as those who took only aflatoxin. Aflatoxin is very rapidly absorbed by the body once ingested. This chemical can be found in may food supplies in developing countries around the world that is belilved to cause problems in the liver, including liver cancer. .
Chlorophyll supplements are also recommended to patients with gastritis. Chlorophyll and aloe vera juice has also know to heal ulcers in your stomach.